Photography Basics - Shutter, Aperture and ISO. Chances are you own a camera. Lots of people now do. Taking photos is great and with today’s technology you can do it at any time. Taking a photograph is now incredibly easy. There really is no excuse for not recording that smile, beautiful flower, stunning view or whatever you come across inspiring enough to make you want to record it for evermore. You can now buy a camera and never understand how it uses basic photography mechanisms to record your photograph. This does mean you let the camera make all the decisions and there will be times when it doesn't turn out exactly as you would have liked. This can be disappointing. This guide has been written to explain the basic photography concepts. Understand these and you understand how your camera works. From the cheapest compact to a high-end professional camera they all use these basic principles. Once you have got to grips with these you can apply your new found knowledge and take better photographs. Here you'll learn about the fundamental mechanisms that effect the final photograph. The aperture, shutter and ISO are camera settings that work together and decide how your image will turn out. Your camera will have options that can set all three for you such that you only point and shoot. You will also have settings that mean you can set some of these yourself. Doing this gives you some control over the image. There may even be a setting that allows you to choose the aperture, the shutter and the ISO. The ultimate control! However before you start to select these yourself you should understand what they do. As too much explanation can be tiring and at times confusing, I have explained these technical terms using non-technical jargon. I want everyone to understand how their camera works so they can get more out of their photography and take better pictures. 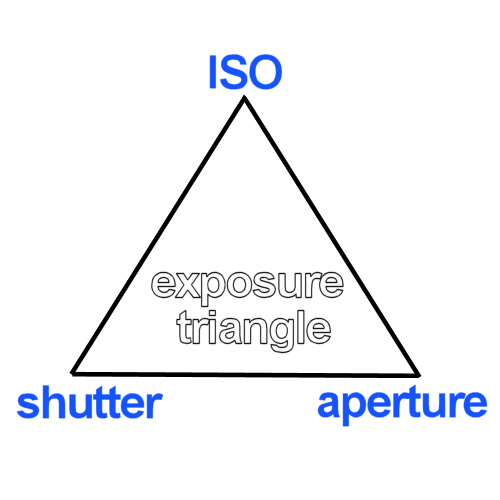 The three components are shutter, ISO and aperture which make up the 'exposure triangle'. Each one affects the others when it's changed. In this article we'll explain how each part works and how they affect the parts of the triangle. We’ll start with the aperture. The aperture is a precisely adjustable opening in the camera lens and one of the mechanisms that controls the amount of light passing through to the camera sensor. The aperture can be adjusted to one of a number of pre-configured settings. These are described using an ‘f’ scale from what are called wide, through to small. Each aperture is designed to let only a certain amount of light through the lens. As you go up the ‘f’ scale towards the higher numbers, the amount of light let through the aperture reduces and as the numbers on the ‘f’ scale get smaller, the amount of light let through increases. As your aperture gets smaller, the amount of light going through the lens is reduced. So the sensor has to be exposed to light longer to let more light in. We will come to this later. A key feature of any aperture is how much Depth Of Field, or DOF, it can achieve. DOF is in front of the camera lens, where you have pointed the camera AND is in focus. It can be measured in centimetres or miles dependent upon the focal length of the lens and the selected aperture. Anything outside the area of DOF is out of focus. 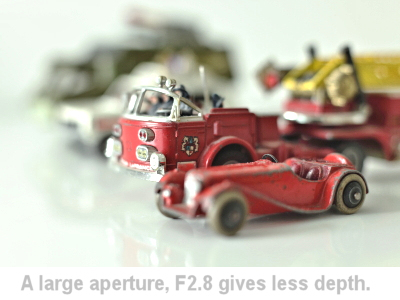 F2.8 – A wide opening, more light enters the camera and gives the least Depth of field. See example image. F22 – a small opening, less light enters the camera and greatest Depth of field. See example image shot at F18. 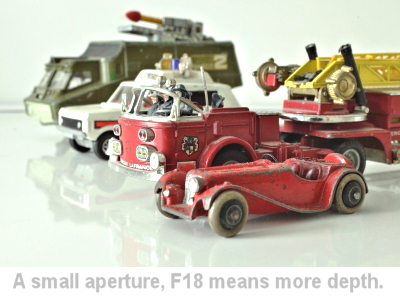 The smaller the aperture, (in terms of opening), like F22, the greater the depth of field. By setting a small aperture like F16 or F22 you will make use of greater DOF and therefore more of your scene will be in focus. This is useful when you take a landscape and want to ensure everything in your view is in focus. When you, or your camera, focuses on a point in the scene you are photographing the aperture will determine how much in front and behind your selected focal point are in focus. Of course you don’t have to use the smallest aperture, you can select any one in your lens’ range and each one will give you varying degrees of depth of field. I very often use f5.6 as this gives me a reasonable focus area but the reduced DOF beyond the subject gives me a pleasant out of focus, or blurred area. This emphasises the sharply-in-focus subject. (This technique is great for portraits). One point to remember here. That the DOF will change dependent upon the focal length of the lens you use. For instance a 50mm lens at f11 will have more DOF than a 150mm lens at f11. (That is a bit advanced but worth remembering). By selecting the appropriate aperture, you decide how much light enters the camera and what parts of the scene you want in or out of focus in the final image. This is a very powerful tool. The shutter is another mechanism that controls the amount of light that enters your lens, through the lens aperture and on to the sensor or film in your camera. If you aren’t familiar with what a shutter speed is then let me explain. When you take your photo, the part of your camera that records the picture (sensor or film) is exposed to your scene by an opening and closing mechanism called a shutter. The length of time this shutter is open is called the shutter speed and measured in parts of a second, seconds or minutes. These speeds vary from as long as 30 seconds up to 1/8000th (yes that’s eight thousands of a second). These are not absolute limits but examples of shutter speeds you can find on typical cameras you can go out and buy today. A fast shutter speed like 1/250th or 1/500th sec will freeze any movement in your subject. This is very useful if you want to take a picture of your dog running around the park or a sprinter in the 100metres. 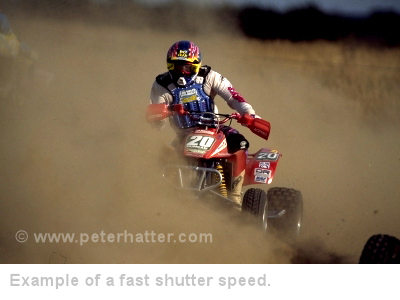 The image of the quad bike to the right was taken with a fast shutter speed of something like 1/1500th in order to freeze the movement of the quad bike as it races towards the camera. 1/5th - Slow shutter, open longer. 1/1000th – fast shutter, open less. Which shutter speed to select can be dictated by the selected aperture. Or the aperture can be dictated by the shutter. If the aperture is open wide and letting in lots of light then a faster shutter speed can be used. A small aperture, letting in less light means the shutter has to be open for longer so a slower shutter is needed. 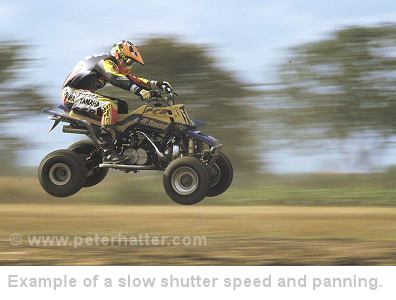 The first image above of the flyng quad bike uses a slow shutter speed, which, when combined with the panning of the camera (moving it with the subject) means the subject is sharp and the background has become blurred. Got an automated camera that does not allow you to set shutter speeds? Some cameras don’t have a feature that let you set specific shutter speeds. However it may have a ‘sport’ program which are generally configured to freeze movement. By using this setting on your camera you will have a better chance of avoiding camera shake. However the camera is also likely to set a wider aperture which in turn means less focus depth of field. A very common cause of disappointing photos is camera shake. This occurs when you have not held the camera still enough when you take your photo. One of the tools in your ‘avoid camera shake toolbox’ is to use a fast shutter speed. When you use a faster shutter speed, your aperture will be wider which in turn means less depth of field. So if you want to avoid camera shake AND select a small aperture for greater depth of field (because you want to photograph a landscape for instance) then watch out for our forthcoming article, The Shakes and How to Avoid Them. If you're looking to become a filmmaker, these settings still apply, however the shutter speed has an impact on the look of the final film and must be considered with the frame rate you are using. This though is a topic for another article so for now we'll stick with seeing how these settings affect your photography. Your camera is a light-gathering machine and how sensitive your camera is to that light is measured by what is called the ISO rating. Sometimes it is also called the ASA rating. The ISO can be under your camera’s control or yours. By selecting the ISO yourself you are making a big decision about the quality of the final image. This rating varies from something low like 50 to something very high like 6400. This scale can of course go beyond each end of the values described here but for the purposes of general photography and this guide, we will stay within these boundaries. The sensitivity of the camera dictates what shutter and aperture setting you will choose to take a correctly exposed photograph and the quality of the final photograph. See part 4 below for more on how these three elements work together. 50 - Lowest ISO. For really good light. Slowest shutter speed and most detail in the image. 200 – a medium ISO and one suitable for everyday use outside. 800 – Use this when the light is very low or you are indoors and need a faster shutter speed. 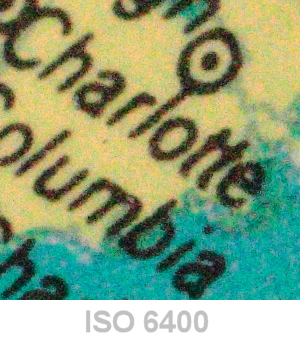 6400 – Highest ISO. For really poor light. Fastest shutter speed and least detail in the image. Lower ISO's will give you more detail and maximum quality of the final image. There will be detail recorded in the darker tones of the image which improves the look of your final photograph. This is a good thing and I will select a low ISO as often as possible. Higher ISO’s mean less sensitivity to light and therefore less recording of finer detail and tone. The darker tones tend to blend in to one large area of colour recording little or no detail. There is also an introduction of 'noise', aspeckled pattern of colour that reduces the quality of the image. See the example here. High IOS's are to be avoided if possible. I use higher ISO’s only when I have to, when there is no way I can use the lower better quality ISO settings and I am also unable to use a flash gun. It's worth mentioning that now, as camera technology improves, higher ISO's are being used to record an image in low-light without introducing noise. Soon, noise will not be a problem at all. However it's always worth being aware of what it is should you come across it. 4. How Aperture, Shutter and ISO Work together. Now that you understand the three building blocks of exposing the photograph, you need to see how they work together to gather the correct amount of light. Each scene you photograph needs a decision from you or your camera about the exposure settings to use and to do this you utilise the shutter, the aperture and the ISO. An important concept to understanding how aperture, shutter and ISO work together is that each shift from one value to the next is called a ‘stop’ and each stop lets in half as much OR twice as much light as the previous stop. Some cameras let you select a half or a third stop but for the purposes of this explanation we will use only one stop. In this table below column1 lets in 1 stop more light than column 2 and column 3 lets in 1 stop less light than column 2. The ISO is the same principal with column 1 being twice as sensitive as column 2 and column 3 being half as sensitive as column 2. Shutter: 1/60th lets in twice as much light as 1/125th and half as much as 1/30th. Aperture: f5.6 lets in twice as much light as f8 and half as much as f4. 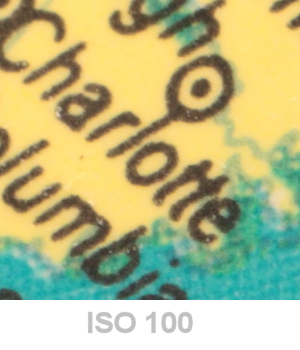 ISO: ISO 100 is half as sensitive as ISO 200 and twice as sensitive as ISO 50. By making changes to each of these settings you can achieve a correct exposure but you can decide which element is the most important and use that instead. An example will make that clearer. If you make a change to one element, say the ISO, adjusting by 1 stop from 100 ISO to 50 ISO, then the shutter or aperture has to be adjusted accordingly to compensate for the loss of 1 stop of sensitivity to light, adjusting either the shutter or the aperture. Lets assume your camera is set to ISO 100, and currently your camera is set to f5.6 at 1/125th. The table below shows you how you can achieve the same exposure by adjusting the shutter, aperture and ISO. Each row refers to the one above. 100 1/125th F5.6 Our starting point. 50 1/30th F8 ISO the same. Aperture adjusted down 1 stop. Shutter opened up 1 stop. 100 1/60th F8 ISO adjusted up 1 stop. Shutter adjusted down 1 stop. Aperture remains the same. 100 1/125th F5.6 ISO remains the same. Shutter adjusted down 1 stop. Aperture adjusted up 1 stop. 200 1/125th F8 ISO adjusted up 1 stop Shutter remains the same. Aperture adjusted down 1 stop. 200 1/250th F5.6 ISO remains the same. Shutter adjusted down 1 stop. Aperture adjusted up 1 stop. I hope from the explanation above, long though it is, that's explained how each element of the exposure 'triangle' affects the others. How the exposure is configured for your shot depends on what's important to the image. For instance, if you're shooting sport where a fast shutter speed is required of say 1/500th, then you'll need a higher ISO and probably a wide aperture. To achieve the shutter speed, some image quality has to be sacrificed or depth-of-field reduced to open the lens in order to get to the desired shutter speed. Another example, shooting a landscape, you want top quaity from the image which means working with a low ISO and probably a small aperture for lots of depth-of-field. To get that you need a much slower shutter speed. Remember, it's all about how much light you let in to the sensor (or film) and trading off the three components, ISO, shutter or ISO against the other to get the right amount of light for the image.